Sumptuous 5-Ingredient Honey Butter Roasted Carrots, an enticing side dish for the holidays! Can you believe Thanksgiving is this week? I’m not exactly sure how this happened… It seems like just yesterday we were dropping the kids off on their first day of school and now it’s late November. Life rushes by so fast sometimes, it’s easy to miss the good parts. I think that’s what Thanksgiving is all about, especially in our day and age. Taking time to stop the madness for a day (and hopefully for a long weekend) to focus on gratefulness. We live in hectic, yet indulgent, society where people are used to getting exactly what they want, the moment they want it. And if they don’t? Temper tantrum. Yet being grateful, even for the little blessings in life, changes our whole entire outlook on our circumstances, family, country, and world. We try to simplify our lives as much as possible. Not allowing ourselves to be sucked into unnecessary business, makes it easier to stop and see beauty in each day. This is true even in cooking… Not all dishes have to be complicated to be spectacular. 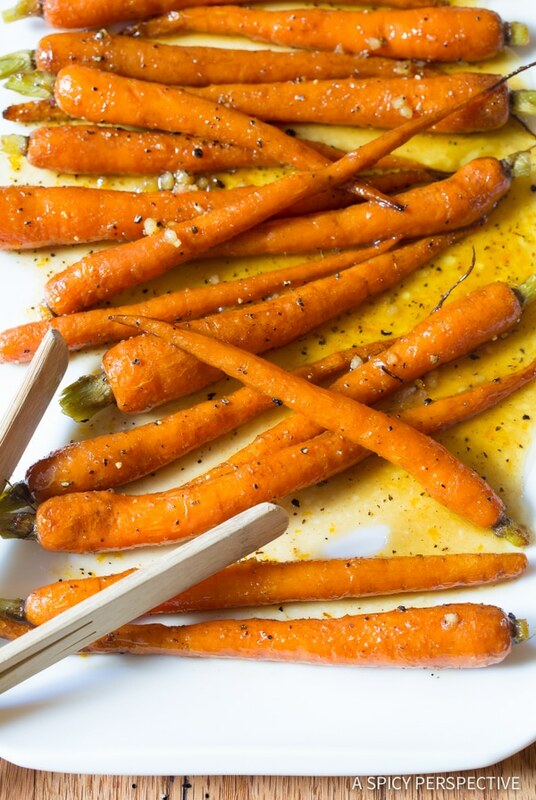 Today’s Honey Butter Roasted Carrots recipe is a perfect example of simple perfection. 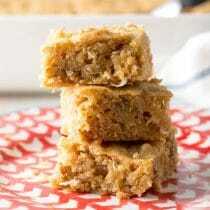 It’s a 5-ingredient recipe that you can prep and pop in the oven in less than 5 minutes. 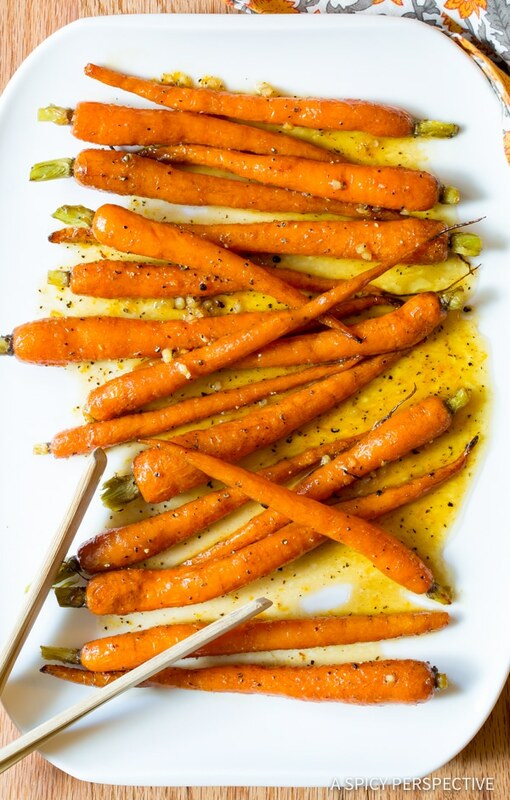 The Honey Butter Roasted Carrots are roasted for a few minutes with only butter, salt and pepper. Then tossed with honey, garlic, and orange zest, and placed back in the oven, to intensify the flavor. 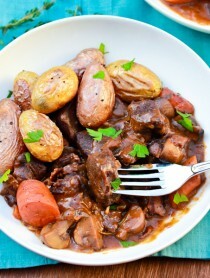 What you end up with is soft succulent earthy carrots with a dazzling savory-sweet appeal. Honey Butter Carrots take less than 30 minutes to make from start to finish, and pair well with nearly every main dish. 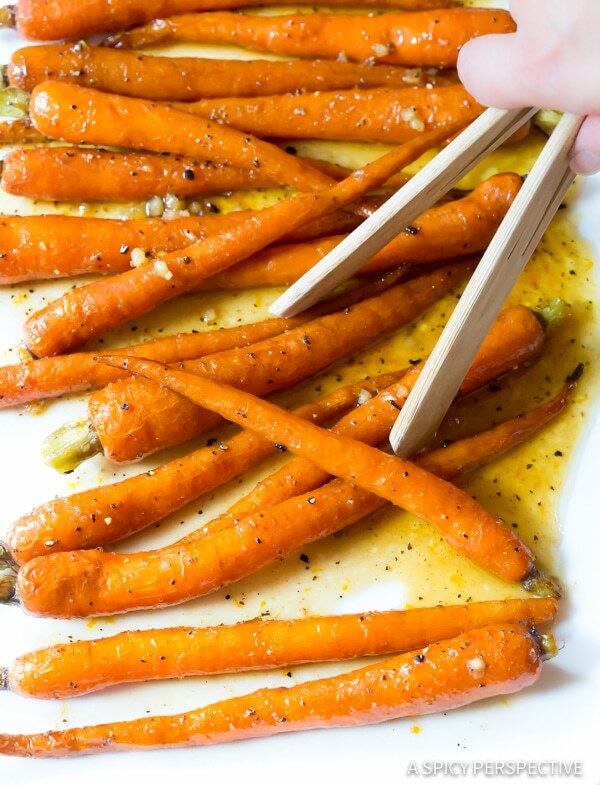 You've got to try these amazing 5-Ingredient Honey Butter Roasted Carrots! 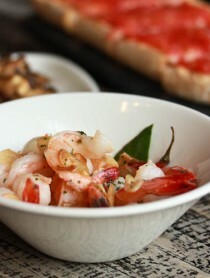 A simple side dish with huge garlic butter and honey flavor. 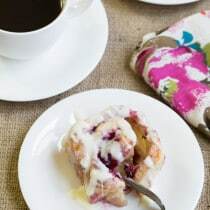 Preheat the oven to 450 degrees F. Line a rimmed baking sheet with parchment paper and set aside. Scrub the carrots thoroughly, then dry. You do not need to peel the carrots, unless the skins are exceptionally rough. 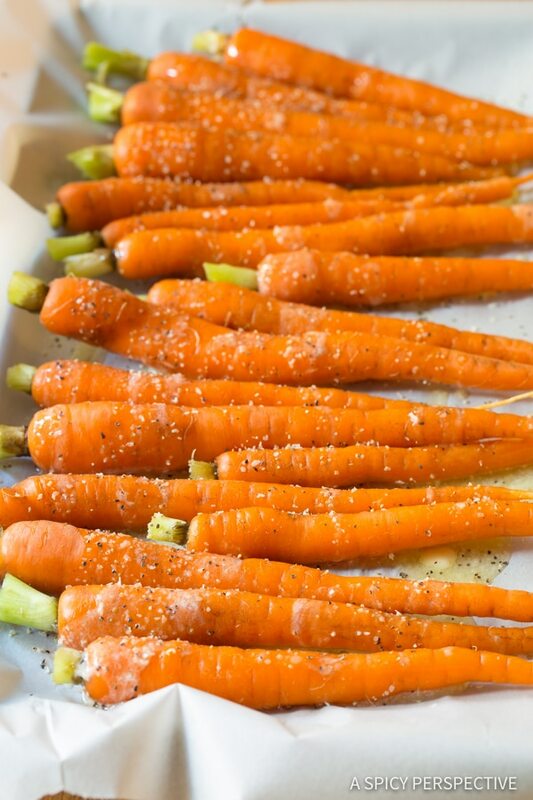 Lay the carrots in a single layer on the baking sheet. 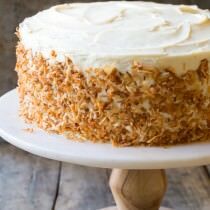 Drizzle butter over the top. Then sprinkle with salt and pepper. Toss to coat, and spread the carrots out again. 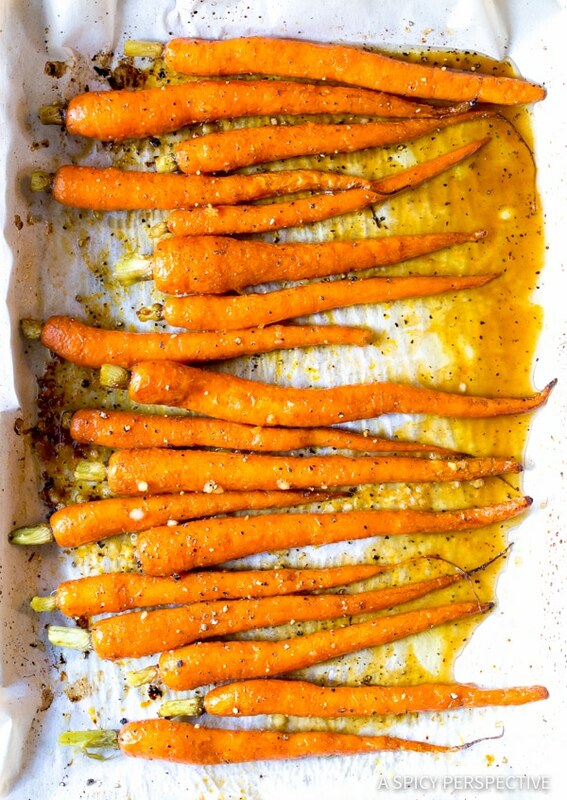 Roast the carrots in the oven for 15 minutes. Meanwhile, zest one orange and mince the garlic. 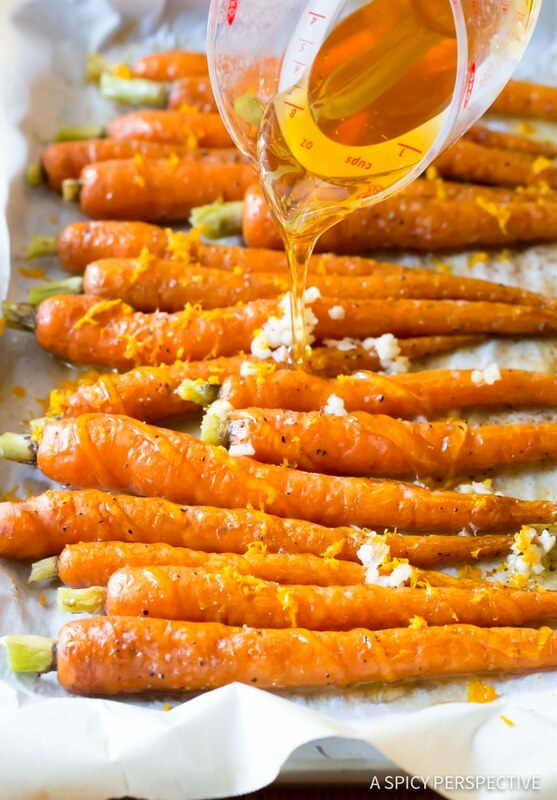 Drizzle honey over the top of the carrots, and sprinkle with minced garlic and orange zest. 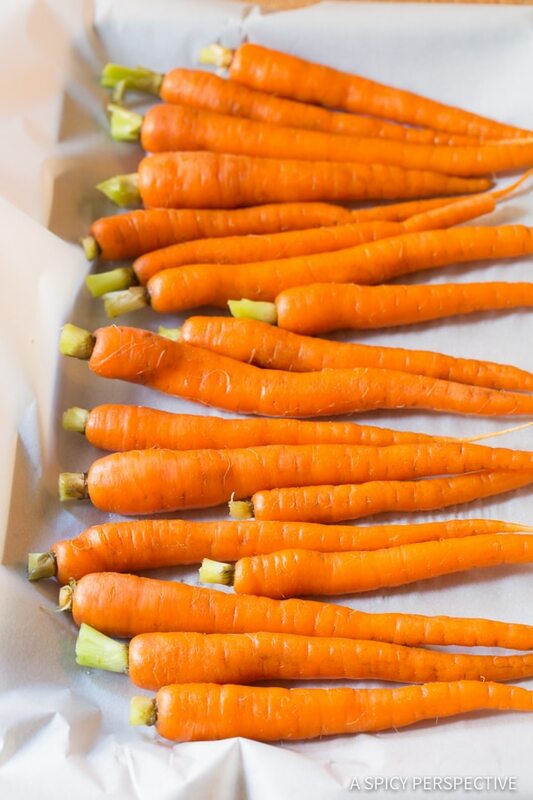 Shake the pan to coat each carrot in honey butter. Then roast again for 5-10 minutes, until the largest carrot is fork-tender. Serve warm. So good! Love these for a side dish, actually gets my family to eat their veggies! 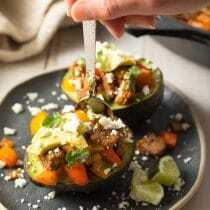 The perfect easy carrots – our whole family loves them! what a fun and delicious way to make carrots. im sure my kids will love these. 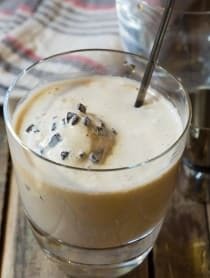 So nice and simple and good! My favorite way to eat carrots. These are gorgeous!